I made a list of 20 things I might want out of a monorepo tool for a Design System to use as a basis for comparing some of the options including Lerna, Northbrook, and Rush. ⚠️ Northbrook's author says the project is pretty dead and now uses Lerna. Test one, some, or all modules: See if there's any specific features, otherwise overlaps with arbitrary commands. Distribute arbitrary bundles: See if there's any way to compose ad hoc bundles, or at least be able to make a bundle module. "Share" dependencies across modules safely: I view this as one of the most important core features. "Pin" common dependencies across modules: I view this as a very important feature. "Link" module-to-module dependencies safely: I view this as one of the most important core features. Distribute to a pre-release channel: See if there's any specific features, otherwise overlaps with arbitrary commands. Support change log generation: See if there's any specific features, otherwise overlaps with arbitrary commands. Support documentation generation: See if there's any specific features, otherwise overlaps with arbitrary commands. Support UI style guide generation: See if there's any specific features, otherwise overlaps with arbitrary commands. Ability to use Semantic Release in distribution: The tool's release feature may fill need, but options are good. Ability to use Commitizen in development: The tool may have a feature that fills a similar need, but options are good. Community Activity: Are other developers posting about it? What's the GitHub activity like? Research was done using the documentation, googling for articles, checking out issues, and a little poking around on basic demo repos. I haven't used any of these tools extensively yet or done more than glance at their source code, so if you see anything I have wrong, please let me know. Tools included are Lerna, Northbrook, and Rush. Has both fixed and independent options. With e.g. lerna publish will distribute any with changes Kinda can with e.g. lerna publish --force-publish=moduleOne,moduleTwo Beware issues with --scope and --ignore! See #1055 and #1384. Isn't actually effective, the way I mean it. Almost with lerna bootstrap --hoist, except see #867. Now can be assisted by Yarn Workspaces for improved sharing that is as safe as Yarn can make it. Perhaps unsurprisingly, Lerna did the best at meeting the qualifications, although Northbrook has appealing simplicity and flexibility and Rush's relatively safer strategy for sharing NPM dependencies and ability to deterministically install and to pin dependencies stood out. Lerna used with Yarn and Yarn Workspaces seems equal to Rush in these respects. Doesn't appear to be any existing integration, could write a plugin. Unclear if you could replace nb release. Doesn't appear to be any existing integration, could write a plugin (or just use alongside?). Unclear if you could replace nb commit. Unclear how a non-conventional commit format would impact nb release. But it passes because it does support plugins and by-module tasks, meaning tooling around the related areas will be easier. Northbrook's design is really appealing to me personally, but as it is mostly an orchestrator of plugins and I'd rather use Semantic Release and Commitizen directly for functionality like nb release and nb commit the appeal over Gulp is mostly in nb exec and nb link. Its relatively lower profile in the community in comparison to Lerna is also, unfortunately, persuasive. NPM only for now, though it's worth noting that Rush claims to be able to deterministically install NPM dependencies, which is one of Yarn's major benefits. Can still set up tooling and run commands normally, but doesn't assist with by-module tasks. It appears it might have an "AEDoc" (API Extractor) integration. But would have to set up custom in project root, and Rush doesn't assist with by-module tasks. Would have to set up custom in project root, and Rush doesn't assist with by-module tasks. Would have to set up custom in project root, and Rush doesn't assist with by-module tasks. Also unclear if you could replace rush publish. Doesn't appear to be any existing integration, could just use alongside? Not marking because it's unclear if it's possible to integrate with rush publish changelog, which would add complication since Rush doesn't assist with by-module tasks. Not checked because it's unclear if or how a root package.json is handled. As with the others, can't use for individual modules. But note this aspect may more appropriately be a feature for Greenkeeper to support. At first, I thought I'd end up favoring Rush because of how well their doc explained the underlying functionality of rush install. But I couldn't find some relevant and clearly necessary-to-me docs about how rush change works; on the test repo I always got output that No change file is needed. Combined with a lack of findable posts from developers that becomes a bigger issue. Side-by-side with Lerna its appeal is mainly its use of safer linking and some of the more enterprise features. 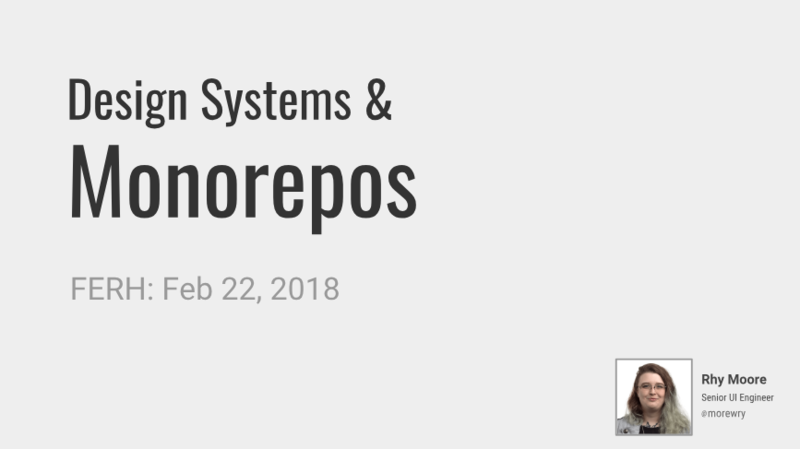 Finally, here's a presentation I gave on how I'm using Lerna monorepos for Design Systems. Greenkeeper now supports monorepos with multiple package.json files.